Foundation is an important element to any makeup look, especially for your wedding day. So, choosing the right base is king. I’ve never been much of a foundation person, which is why I started my research months ago. What I’ve learned is that there are a lot of foundations out there and they all claim to do the same thing. The first step for me was deciding what I wanted out to get out of the foundation. Do I want my skin to look matte or luminous? How much coverage do I want and/or need? 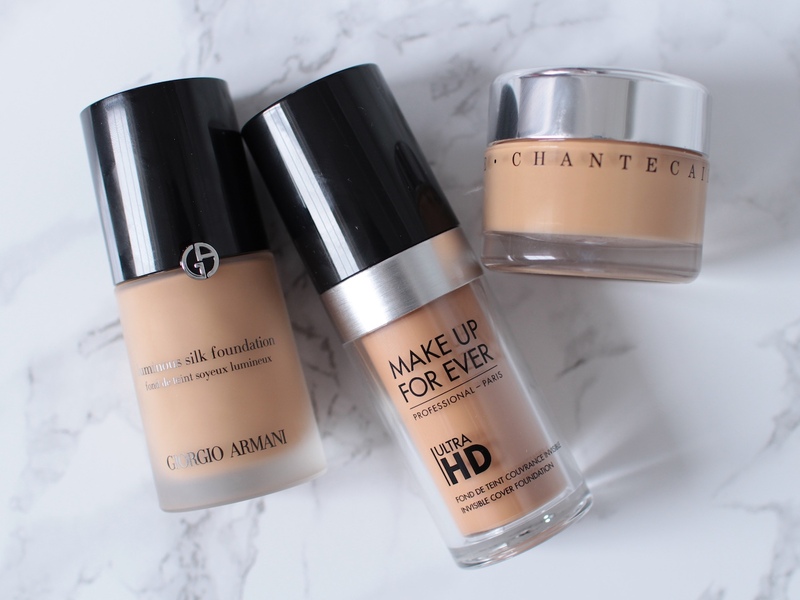 Do I go for a liquid, compact or stick foundation? Seriously, the options are endless. With those criteria in mind, I found three great bases that I really liked. 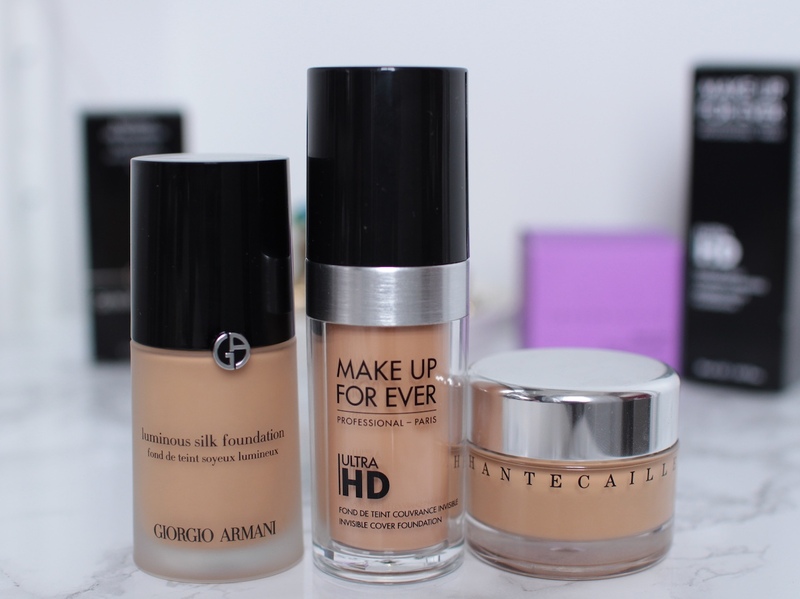 This is probably the most popular wedding day foundation. Every blog I read, every magazine I flip through raves about Luminous Silk. I can see why because it is a beautiful foundation. It's a liquid foundation that has an ultra-smooth texture. It offers a light-to-medium coverage. It glides beautifully on the skin and dries to a natural finish. It does leave your skin with a slightly luminous finish, but don’t confuse that to mean shiny. It also wears well throughout the day. It does contain some fragrance, although I've never been sensitive to that. This foundation comes in 12 shades, but it took a while for me to figure out their numbering system. I ended up getting three different shades (5.75, 6 and 6.5) to try because I couldn't quite tell where I fell. No. 5.75 looked beautiful on, just the right amount of yellow undertone, but it looked grey under a flash. No. 6 had a tinge of an olive green undertone that clashed with my skin. No. 6.5 ended up being the perfect match because it looked great under all lights and in flash photography. I really liked the original MUFE HD foundation, so I was interested to see how they improved on an already awesome product. No surprise, Ultra HD is still an awesome formula. It has light-to-medium (yet buildable) coverage and it still looks natural on the skin. It feels lighter on the skin than the original formula, but it offers the same amount of coverage. It dries to a wearable satin finish and just like Luminous Silk, it photographs beautifully. I am in the shade Y375. In the original MUFE HD foundation, I was in the shade 123 (now equivalent to Y365) and I could still get away with that shade, but I find Y375 to be a slightly better match. For your reference, I am an NC35 in MAC’s Studio Fix Fluid. Chantecaille Just Skin (a sheer, lightweight tinted moisturizer with a glowy finish) is my all-time favourite base, but for the big day, I wanted something with a bit more coverage. That's where Future Skin comes in. Future Skin is an oil-free gel foundation that has light to buildable coverage. This feels like a creamy moisturizer and it is so easy to apply. It probably offers the least amount of coverage between the three, but it glides over the skin flawlessly for a natural finish. It wears well throughout the day, but it definitely needs to be set with a powder to hold its place on my t-zone. I have to wear a primer with any base I use if I want to keep it intact until the end of the night. 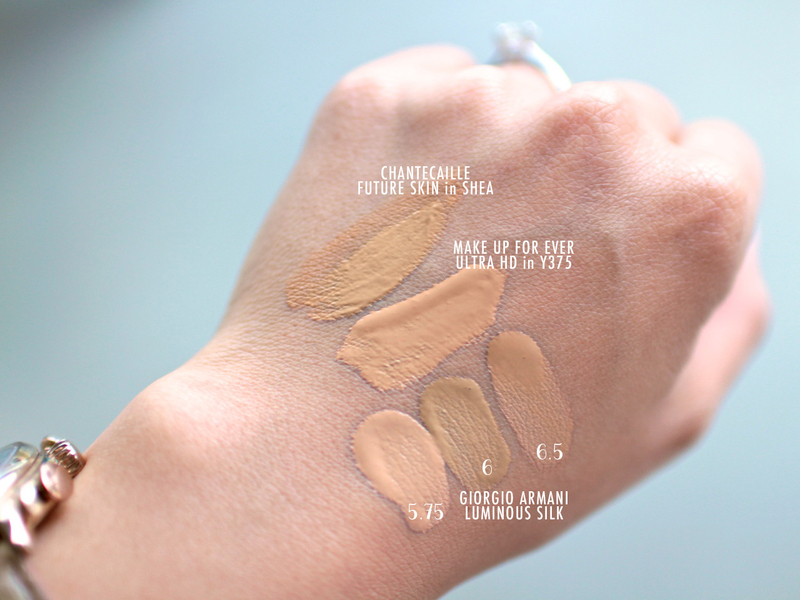 In terms of shade range, there is a good selection in Future Skin, but keep in mind that the shade range for Future Skin and Just Skin are not the same. I'm in the shade Shea in Future Skin and Wheat in Just Skin. The only con I have about this product (aside from the price) is the packaging. I'm just not a fan of any product that comes in a jar.